Patios need regular cares and cleaning to be kept in good condition and don’t look neglected. Unmaintained patios make the garden dark, colourless and gloomy. Our patio cleaning services which we provide in the area of Putney SW15 guarantee excellent washing of all kinds of stone surfaces. They are implemented by professionally trained and experienced technicians who can transform any outdoor area into an attractive and pleasant place. Call us any time to order the patio cleaning which you need and you will have the work implemented professionally and fast. If the patio, walkways or driveways in your property have overgrown with moss, weeds and need professional pressure washing, use our services to restore them. Our technicians will jet wash the paved, brick, concrete and stone ground and external walls in your property. They use hot or cold water with the jet washers depending on the surfaces that are cleaned. The cold water is applied under pressure to remove all stains, dirt and grime. The hot water pressure washing kills and eliminates moss and algae preventing it from growing again. Our technicians can apply an anti-bacterial agent to slow down the further growth of the moss. 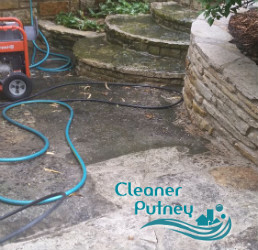 Rely on our company that is located in Putney to provide the patio cleaning which your property needs. It will restore its attractive appearance. If you use our services the paved, concrete, brick and stone surfaces of your outdoor areas will be rid of the algae that make them slippery and dangerous. Our staff will eliminate the moss, weeds and stains from the ground and external walls. 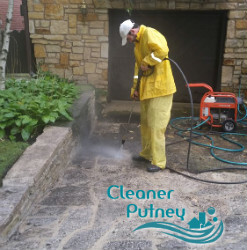 Use the professional patio cleaning services that we provide in SW15 Putney to maintain your driveways, garden paths and external walls clean of grime, obstinate stains, algae, moss and weeds.